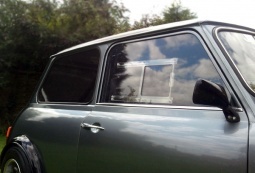 Pair of Lexan or Makrolon Polycarbonate Front Door Windows (driver and passenger side) designed to fit the Mini Classic Mk3 onwards. Clear Lexan or Makrolon, bronze-tinted Makrolon or grey-tint Makrolon. Front door windows can be manufactured using Makrolon Hard Coat, which has a hard coating applied to it during manufacture, offering maximum protection against surface abrasion and chemicals - ie. 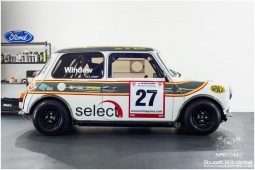 fuels and fluids that windows are commonly exposed to in motorsport.